Uncertainty is looming in the Bangkok residential property market, according to CBRE. 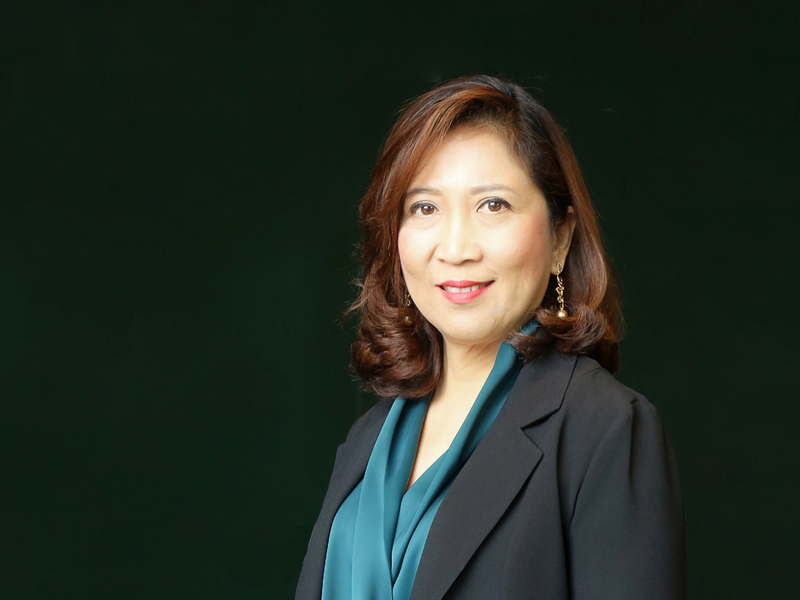 Ms. Aliwassa Pathnadabutr, Managing Director of CBRE Thailand. Although developers have recently increased their launches of condominiums, sales to Thai buyers have slowed in some locations and are likely to slow further with the coming imposition of tighter mortgage lending. Some developers are trying to find locations where there is real demand from Thai end-users and develop projects that buyers can afford. Others have increased their reliance on foreign sales where there is uncertainty as to who will be the final occupier. The downtown expatriate rental market is stable, but CBRE thinks the local rental market in the midtown/suburban areas is quite flat, so buy-to-rent investors may not achieve the yields they were expecting. The Bank of Thailand has recently imposed tighter regulations on mortgage lending by reducing loan to values (LTV) for certain categories of purchasers in an effort to curb mortgage and property market risks and improve housing loan quality. Effective from April 1, 2019, these new measures will favour first home buyers with genuine demand as opposed to buy-to-rent investors with multiple outstanding mortgages, who are searching for yield. Although the new regulations will not force developers to collect minimum down payments at contract signing, it will encourage them to collect higher down payments to reduce the risk of loan defaults upon transfer. This will reduce the demand from speculative buyers as they will be required to pay up to 20-30% for the down payment from today’s 10-15%. These measures will certainly cool down and stabilize the overall market situation. As domestic demand is expected to shrink as a result of the new mortgage restrictions, CBRE anticipates a domino effect where developers will further shift their reliance towards foreign buyers, who purchase primarily with their own funds, as all the money must come in from overseas as foreign currency to comply with the foreign condominium ownership regulations. Many developers have reported that they have increased foreign condominium sales, particularly to Chinese buyers, both in the form of individual purchases and bulk purchases by Chinese property agencies. Several projects have revealed that they have reached their limits of foreign ownership quota (49% of the saleable area) which has been a very rare occurrence in the past. Based a survey by CBRE Research, roughly 7,200 units were launched in the downtown area in Q3 2018, compared to only 1,300 units launched in the first two quarters of the year. The total number of downtown units launched in the first three quarters of 2018 represents an 8% growth from the same period last year. The average asking price of units in freehold condominium projects which were under construction (high-end and above) in downtown Bangkok increased slightly by 1.7% Y-o-Y to THB 277,000 per square metre. CBRE does not believe that average prices in the downtown area will drop, except possibly in a very limited number of completed projects with a high level of unsold inventory. According to developers, sales performance of under construction condominium units in the downtown area has dropped to 67% compared to 77% from the same period last year. The outlook is that sales will be relatively slow for most projects in the downtown area with buyers being more selective, especially for projects that are asking for more than THB 300,000 per square metre. Developers looking to achieve high price levels will have to convince buyers that their project is really worth top prices. CBRE Research reports that a total of 18,200 condominium units were launched in the midtown/suburban areas this quarter, the highest number of units launched in a quarter since Q3 2013. The total number of midtown units launched in the first three quarters of 2018 represents a decline of 4% from the same period last year. Developers are now focusing on locations along the future mass transit lines such as the extensions of the BTS Green Line and MRT Blue Line as well as the under construction MRT Orange Line, Yellow Line and Pink Line. 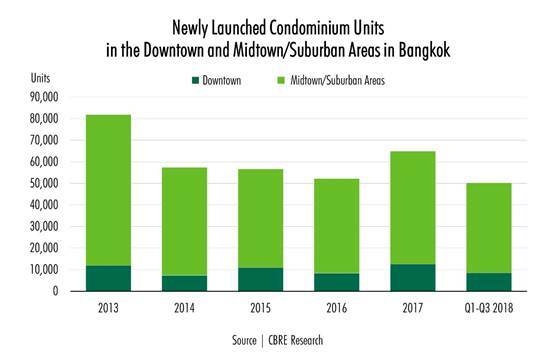 The average asking price of off-plan condominium units in midtown/suburban Bangkok increased slightly to THB 99,700 per square metre, up by 5.6% Y-o-Y. The sales performance of more than 200 midtown/suburban condominium projects that were under construction was 71%, compared to 59% in the same period last year. CBRE believes that the improvement in sales performance of projects in the midtown/suburban areas can be attributed to block sales to Chinese property agencies, although it is uncertain whether these sales will actually translate into transfers at completion. With rising supply and uncertainty about domestic end-user driven demand and some fears about the sustainability of foreign demand, the outlook for the condominium market has become more uncertain. In the downtown market, there may have to be some realignment of developers’ expectations on prices in the prime areas or concentration on central locations with slightly cheaper land prices such as Sukhumvit 63 (Soi Ekkamai) rather than Sukhumvit 55 (Soi Thonglor). The midtown/suburban market will have to be increasingly reliant on Thai end-user demand for projects where buyers can get a mortgage with fewer speculators and buy-to-rent investors.